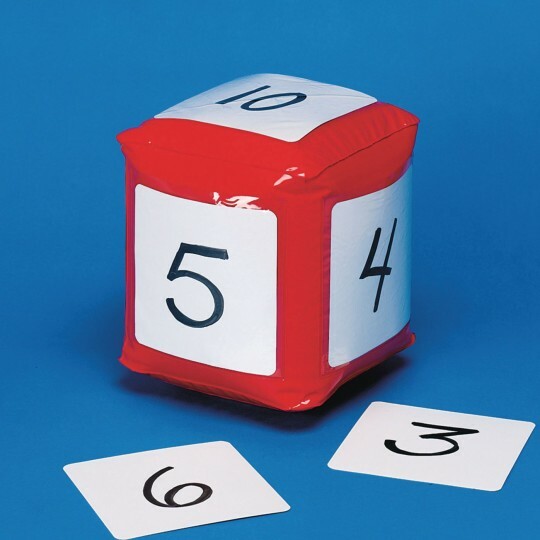 Lightweight and safe 8" dice with write-on wipe-off 5-1/2" square cards that slip into plastic sleeves on the dice. Fill in with exercises to spice up your fitness program, or simply use for fun worry-free tossing games! Awesome idea but punctures easily! I really wish that this product lasted longer! Only used it three times and it already has a hole in it! I purchased these for teaching chance dance and BOTH dice had a whole by the 2nd day. It comes with a patch but certainly shouldn't have it use it by the second day. and no the students were not terrorizing the product. Simply rolling I am going to call and ask for a replacement but with both of them getting a hole so soon sadly I am banking it on being a quality issue. 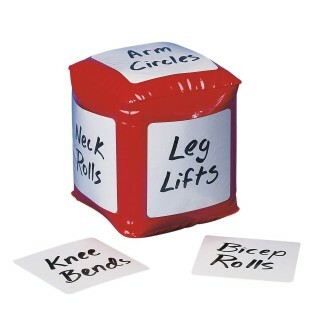 These cubes were bought for make your own fitness breaks in the classroom. Note the cubes do not come with a marker. Hard to tell from the package what they are for so I printed a copy of the examples from the photo online and taped to each package to give teachers starter ideas. Adds variety to elder's exercise programs. Many uses Must have for P.E. teachers! Great for teaching levels pathways and locomotor skills. Also great for fitness games. The wipe off boards allow you to modify the dice to fit your needs. Must have for P.E. teachers.